Attend the Gourmet Gala, We’ll Give you a Discount at the Historic Smithton Inn! 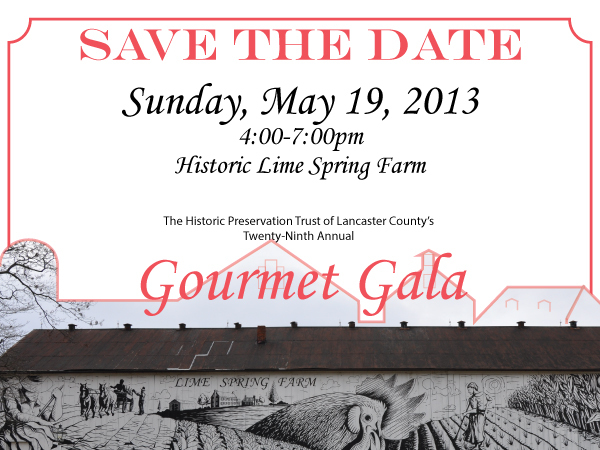 This year’s Gourmet Gala at Lime Spring Farm looks like it’s going to be a fantastic event! The Gala benefits the Lancaster County Preservation Trust, which is an organization near and dear to our hearts. And the venue, Lime Spring Farm, is a popular local wedding venue that I can’t wait to visit for the first time, it looks just beautiful! The organizers have over 30 restaurants, breweries, wineries and other food suppliers lined up to serve attendees… and these aren’t ‘slouch’ establishments either… they’re some of our favorite dining venues in the county! To help promote this event and support an organization we believe in, we’re offering any guest who stays with us on Sunday, May 18th AND attends the Gourmet Gala, 15% off your room rate! The discount will apply to the entire length of your stay… so why not come out early and enjoy a long weekend? !